Checking your computer is compatible with Kaspersky Endpoint Security 11.x for Windows Full Disk Encryption. Gathering detailed diagnostic information should Full Disk Encryption not run due to incompatibility issues. The tool does not work on computers where the FDE feature is enabled in Kaspersky Endpoint Security for Windows. FDE Test Utility can’t be used on multi-boot systems. 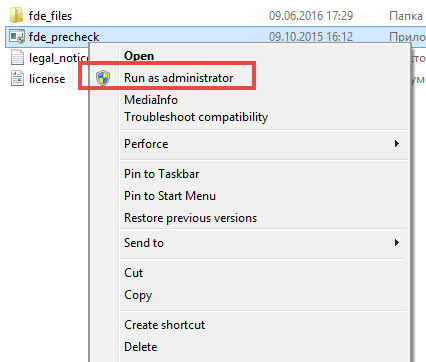 Administrator permissions are required for running FDE Test Utility. For Kaspersky Endpoint Security 11.1 for Windows. For Endpoint Security 11.0 for Windows and Kaspersky Endpoint Security 11.0.1 for Windows. Download the fde_precheck_5.1.61.0.zip archive and extract the files from it. Run fde_precheck.exe with the administrator permissions. FDE Test Utility will run simplified compatibility tests. If simplified tests are completed successfully, FDE Test Utility will prompt to run additional tests. For performing the additional tests, two automatic computer restarts are required. The tool will prepare the environment for tests before booting and then will initiate the first restart. During the preparation, the operating system loader will be replaced with the FDE Test Utility loader. Before the operating system starts, the tool runs some interactive checks on compatibility with the input devices. Upon completion of interactive tests. The operation system loads. The tool restores the loader and restarts the system again. Upon the second restart, the tool will create the report in a file named fde_precheck_report.txt. 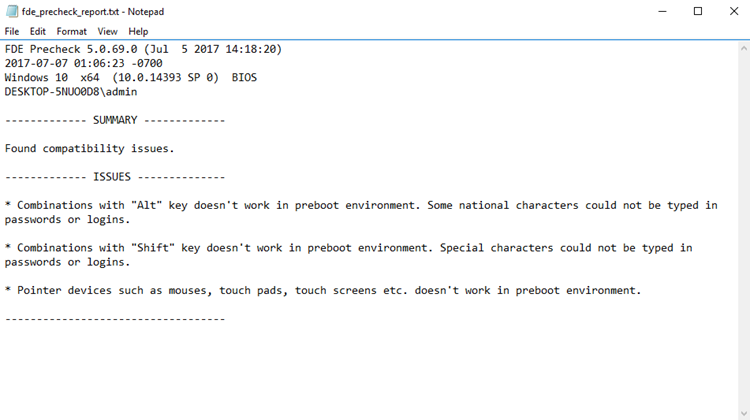 If you need to send the information for analysis to technical support, then you should send the fde_precheck.log and fde_precheck_report.txt. FDE Test Utility performs interactive tests for keyboards, pointing devices (mice, touchpads, touchscreens), and tokens. Click Next or press Enter on the keyboard. The test checks if the user can enter characters ad combinations with Shift and Alt keys from the keyboard. Any keys with the Shift key. Any keys with the Alt key. Click Next. If the keyboard or certain combinations don’t work, click Skip. The test checks if mice, touchpad, or touchscreen work. For this test, you need to use these devices to click on four squares positioned at four corners of the window. If the device does not work, press ESC to skip the test. This test is intended for checking the capability for pre-boot authentication using tokens or smart cards. For this test, you need to insert a token or smart card and enter the PIN. If you do not use tokens or smart cards, click Next. This test does not require user’s actions. After it completes, the operating system is loaded. Version of the FDE Test Utility. Start time of the tool. Version of Windows and the operating system architecture. Computer name and user name. The Summary section with the summarized tests result. The issues section with the list of detected issues. The Testing tokens section with the results of testing tokens and smart cards. If this command helped, you should enable the Use USB Legacy Support option in the policy for PC encryption.